Happy Track is Yuma’s first and only motocross facility. It was created by life long motocross enthusiasts for the benefit of the communities of Yuma, Imperial Valley, and the surrounding areas. Happy Track's goal is to provide Yuma Arizona with a first class motocross facility that is a fun and challenging but safe place to practice and race. Our motocross track has ample lighting and is watered by an underground sprinkler system. The track surface is groomed each week and there are no rocks. Practice is split between small bikes and big bikes at 25 minute intervals. Expert level small bike riders are allowed to practice with the big bikes as long as they are 12 years of age or older, are on an 80cc or larger bike, and can run the pace of the faster big bike riders. 928MX Presents, Lake Havasu Motocross Park! A full-time motocross track and practice facility facility located at Sarah Park in Lake Havasu Arizona! Just after the entrance of Havasu 95 Speedway! See our website for practice and race dates, call before you ride! MC Motorsports Park was formerly known as Pima Motorsports Park. 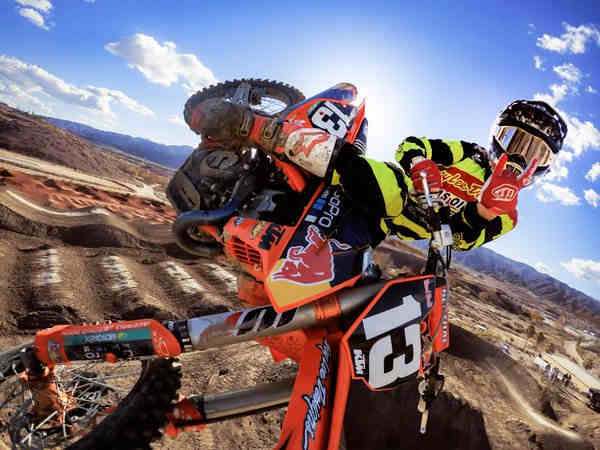 The track is located in Tucson Arizona, and reopened to be one of Arizona's premier motocross facilities. The motocross track hours vary from summer to winder, so call MC Motorsports Park's hotline before you plan to go ride! Motoland MX Park is one the finest tracks in Southern Arizona. Offering multiple motocross tracks, a full stock trackside store, refreshments and a friendly staff. Motoland Trackside Store and Snack Bar carries a full snack bar on location and a full service store. Parts and Apparel are needs. Fall Hours: Saturday & Sunday 6am to 12pm. "Call before you Haul" 24 Hour Hotline: 520-421-1716 Track side Store 520-483-4180. Location: 6734 Sisler Road, Casa Grande, AZ 85193. CLOSED DUE TO LEGAL ISSUES. Grinding Stone Motocross Park once offered 1.4 miles of track with several elevation changes. The Motocross track can was changed for Bike and ATVs according to event, as well as UTV’S. The motocross track was very flowing with a mixture of loam and granite. Skill level for Beginners to Pro. Thunder Raceway's motocross track is back. Bringing in the 20th anniversary of Thunder Raceway. New ownership of the track New events, New races for 2016. CLOSED PERMANENTLY. This motocross park at one time featured an expert supercross track, peewee, vet track as well as an oval dirt track and a supermoto practice track but is now closed. The main motocross tracks were lighted, groomed, and watered for evening practice and both bikes and ATVs were permitted. This listing will remain for a couple of years to end any confusion and hopefully save a few wasted trips. CLOSED PERMANENTLY. MotograndeMx Located in Casa Grande, AZ has been involved with motocross since 1998 and is considered Arizona’s premier motocross track. MotograndeMx is a local favorite track, challenging to every rider of all skill levels. Whether you are a beginner or a seasoned professional you will find the jumps, table tops, rhythm sections, and turns challenging and fun! We assure you will have a good time and most of all a safe ride. Track prep is always of the utmost importance at MotograndeMx, when you come to ride you will find the track properly groomed and watered for excellent traction and minimal dust. The track has NO rocks and the best lighting for safe and enjoyable night riding. Along with the regular motocross track is a track for minis and a flat track for ATV or Go-Carts. The Supercross track is only open to Pro riders and requires special permission from the track owner. Please follow the track rules, which are available in the forms section on the web site and posted at the track along the fence. Come out, have a good time and ride safe. Spectators are welcome so come on out and enjoy the experience of live action motocross. We look forward to seeing you at the track!